A second chance. Or in this case, a 20th chance. 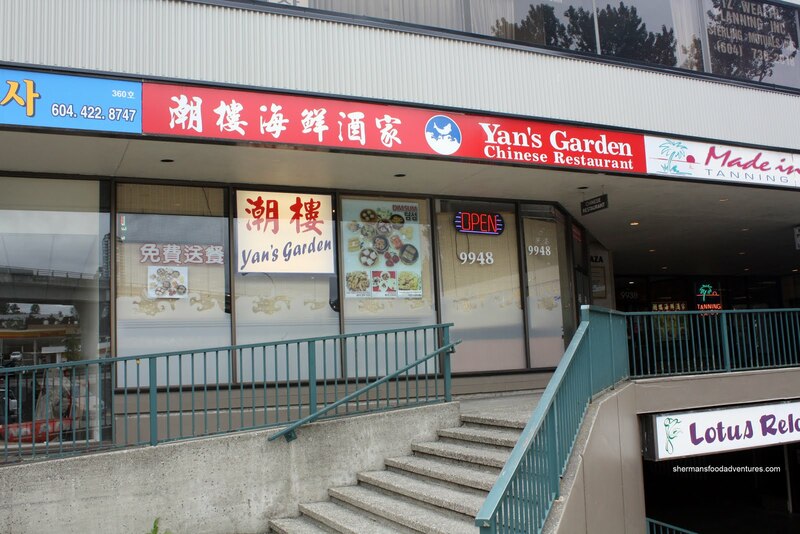 There was a time we would frequent Yan's Garden for both Dim Sum and dinner. And why not? 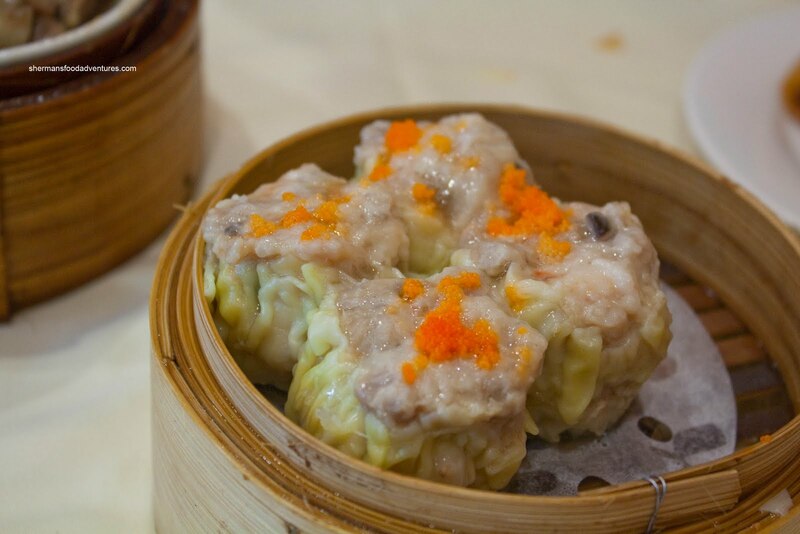 There is not much to choose from in terms of decent Chinese food in and around the Lougheed and North Road area. However, I stopped eating at Yan's because their service just plain sucked. In fact, it sucked even for a Chinese restaurant. They would routinely make mistakes and not own up to it and their servers really needed some attitude adjustments. Hence, my last post on this place was not at all glowing. However, it was time for a re-visit and to see if things have changed. JuJu did his usual Facebook shout-out for food and once again, I was first to respond affirmatively. He wanted Dim Sum and I wanted a redo at Yan's. Perfect. Interestingly, the first thing I noticed was some familiar staff members from Wah Lun. JuJu arrived first and just like the ravenous eater he is, there was a plate of Shrimp Spring Rolls already missing a few pieces. So for the record, there should be four rolls, not three. 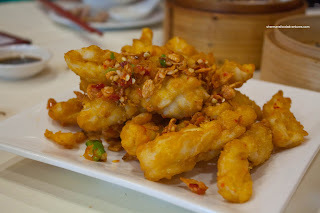 These were pretty good with big crunchy chunks of shrimp in a perfectly fried wheat wrapper. 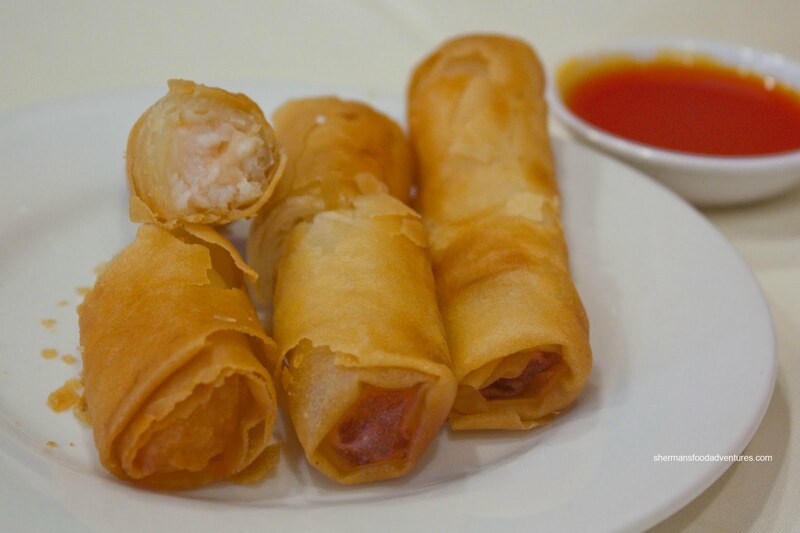 Most of the time I scoff at the sweet 'n sour sauce served with spring rolls (since it should be Worcestershire sauce instead); but in the case of a shrimp-filled spring roll, it works alright - almost in the same way as a fried shrimp wonton. Since Yan's still employs push carts, we were at the mercy of what was available at the time. So no Haw Gow at the beginning; yet we did track down some Sui Mai. These were okay. The pork was slightly chewier than we would've liked. It didn't exhibit the desired "bounce" texture; rather it was too much like regular pork. Furthermore, the dumplings stood to be seasoned more aggressively. Next up was the Blackbean Spareribs. As you can tell in the picture, they were mainly meaty pieces with little to no cartilage (which is a good thing). 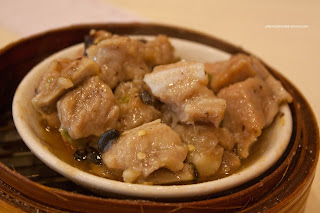 The meat was tenderized so that it was easy to chew while not completely pulverized either. There was a good amount of black bean and garlic seasoning as well. This was a solid dish. We had the Deep Fried Glutinous Pork Dumpling next. This item is not as popular as it once was, especially during the 80's. Since they had it here, we jumped at the chance. Now, these "Ham Sui Gock" are not the most healthy items available; but they are soooo good. 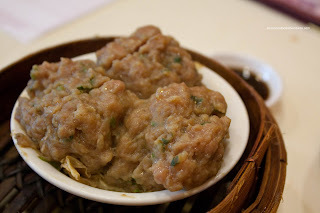 It is basically ground pork, shiitake mushrooms and pickled vegetable in a starch thicken sauce encased in glutinous rice cake (think mochi), then deep fried. 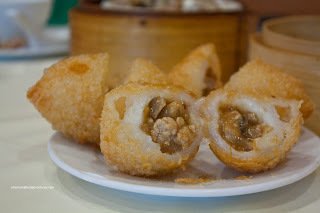 These were pretty good except that the outer layer of glutinous rice was too thick. Other than that, the outside was crisp while the filling was tasty and plentiful. For no other reason that it was in the cart that next arrived at our table, we got the Beef Meatballs. That's the thing about push carts, you end up ordering stuff because it's there, not because you really wanted it. In the end, it was not a bad choice since these meatballs were good. The texture was perfect being moist with a slight bounce. 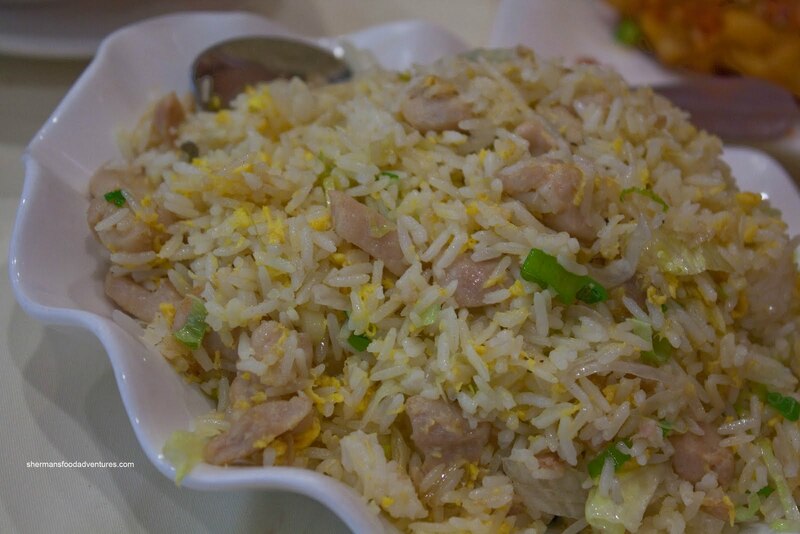 We really liked the pronounced dried orange peel flavour, it added a lot to the dish. 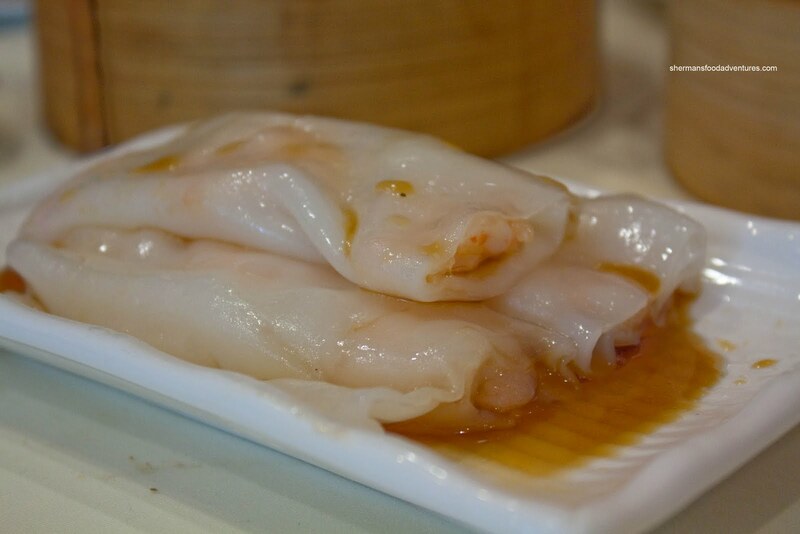 For us, Dim Sum is not complete without a rice noodle roll. In this case, it was a Shrimp Rice Noodle Roll. This was quite average. The rice noodle was on the stiffer side while the soy sauce was surprisingly bland. It was probably watered down too much when they made the soy & sugar mix. At the very least, the shrimp was cooked properly and it was somewhat cold-water crunchy. Once again, the lure of food on push carts struck again. We were not planning to order the Deep Fried Squid with chili salt; yet we did. I guess we were talked into it. Well, it really didn't take much convincing since JuJu and I are easily influenced by anything edible. Unfortunately, this was a bad decision. The squid itself was very good, in large pieces and with a great chewy texture that was still easy to eat. Furthermore, there was plenty of seasoning in the form of salt, chilis and garlic. The problem was with the batter. The large pieces of squid made the batter soggy and in some inner parts, not cooked completely. They really needed to make the pieces smaller or cut them in a different manner. 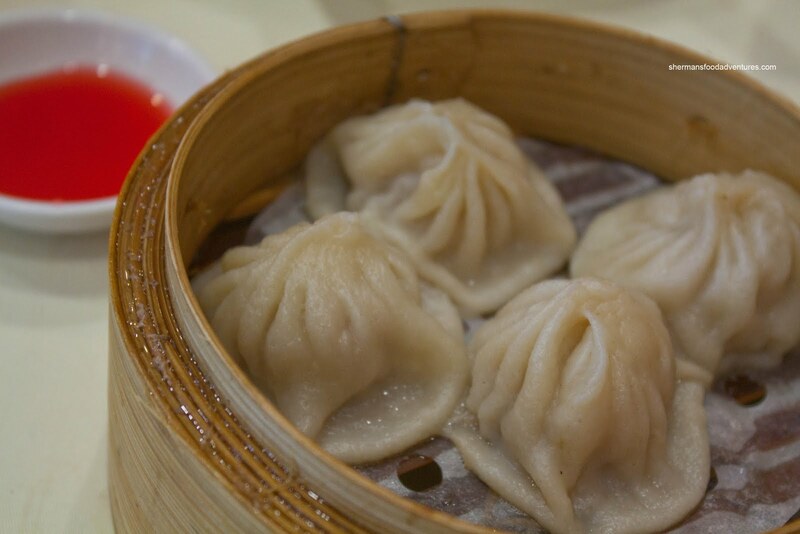 Once again, we got the Xiao Long Bao for no other reason than JuJu must have it for Dim Sum. Yes, we realize it is a Shanghainese specialty served in a Cantonese restaurant. The chances of it being actually good? Nil. 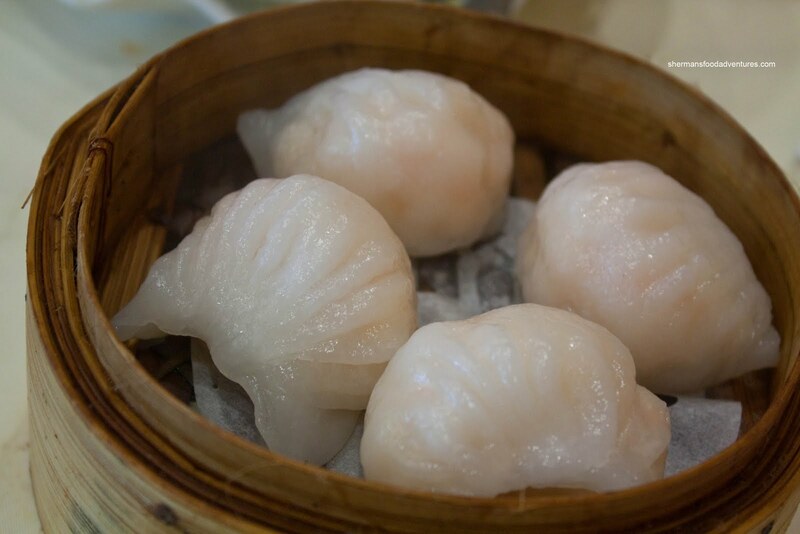 Now if we look at it from the perspective that it is merely a pork dumpling, then it was acceptable. This had to be the attitude going into it because the XLBs had no juice whatsoever and the dumpling skin was thick. Getting through the skin, the non-gritty meat was actually okay being well-seasoned with a hint of ginger. Just don't call them XLBs. As if there wasn't enough food already, JuJu wanted to get the Salted Fish and Chicken Fried Rice. It arrived on a clamshell-like plate that was deceiving in terms of the amount of food. There was a lot of rice and well-priced at $8.95. Now the rice itself was good being dry with not much in the way of clumps. The chicken was moist and there was a decent amount of salted f ish. However, the rice lacked seasoning and wasn't as salty as we would've liked. No problem though, it was still a very acceptable attempt. e nough. 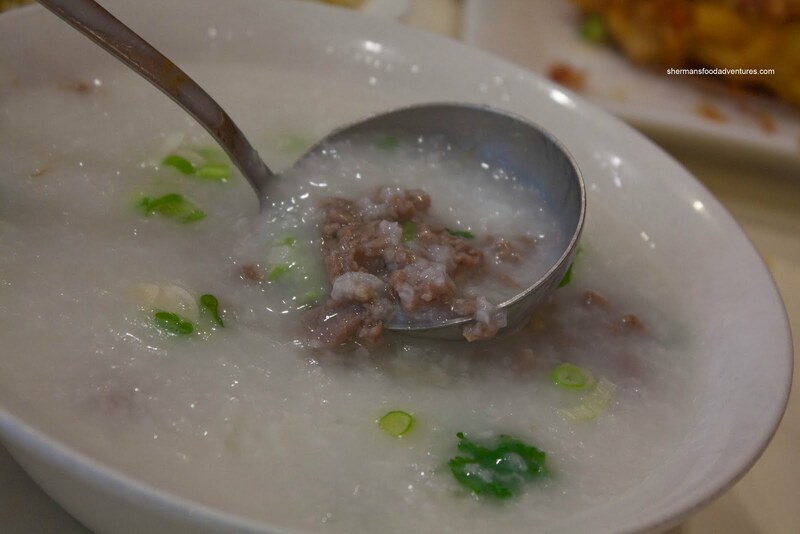 This was a very bad version of congee. Now, if you have been paying attention and reading this (rather than just looking at the pictures! LOL...), there is one significant item missing. Yes, it is the Haw Gow or Steamed Shrimp Dumpling. For some reason or another, it was not available from the push carts. I would like to believe that they wanted to make it fresh and not have it sit in the cart for too long. But in reality, I suspect they don't want someone taking 10 orders of it as the cart passes by. So we had ordered it near the beginning of the meal and it arrived as we were almost about to give up and just get the bill. Was it worth the wait? Not really. The dumpling skin was okay, maybe a little on the gummy side. On the inside, the shrimp was mostly in little pieces (albeit a good snap texture) and there was a good amount of binding agent, which was not pleasant. So, just like my previous visits here, the food has its highs and its lows; but it is mostly decent. Considering the location, Yan's is probably one of the better Chinese restaurants in the neighbourhood. The service was better this time around; but it is still very indifferent and inattentive. I guess that is an improvement over the rude and "screw-you" attitude on previous visits. Wasn't this Stephen Yan's "Wok With Yan" launching pad ? 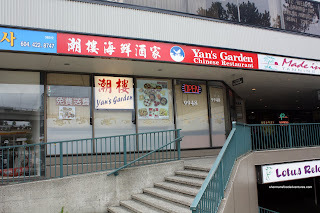 I'm quite sure it was, but back then it wasn't called Yan's Garden. Watch this comeback from Stephen against Letterman !